Measure the width of the window and decide the length you want for the valance. Unless you are using extremely stiff fabric or you want a flat valance, multiply the width of the window by 1.5 to 2 for the desired width. For example: For a 36" wide window—using a fairly stiff fabric—36 X 1.5 = 54" If your fabric is 45" wide you will need to seam the fabric for the desired width. Although a 30 - 32-inch wide window would calculate out at (30" X 1.5 = 45) or (32 X 1.5 = 48") it is your call as to if you will be adding extra width to 45" wide fabric. If you only need a few extra inches and want the extra width, sew together two equal pieces to make the width instead of just adding a couple inches on one side. 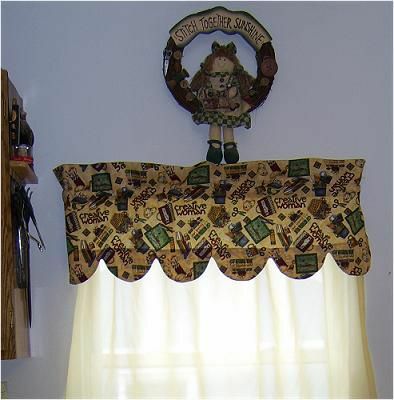 OR Sew two separate valances and use the two valances. Always preshrink the fabric and trim away the selvage. One of the beauties of sewing your own window treatments is that you decide the length of the finished product. You will need a facing to hem a scalloped valance. The width of the hem facing is the same as the width of the valance. If in doubt, play with a paper pattern to practice before cutting fabric. Press under 1.25 to 1.5 inches on the sides of each valance panel for the side hems. Press under .25 to .50 inch of the hem to enclose the raw edge. Find a plate or circle template that will be the size of your desired scallops. Fold the width of the valance into even sections that are approximately the size of the desired scallops. Cut the fabric to the scallop markings. Cut one layer at a time if that is what your cutting tool will handle. The goal is to create neatly, evenly cut scallops rather than chop through all the layers at once. Measure 1.5 inches above the upper part of the scallop to the bottom of the scallop. This is the length of the hem facing. The width is the same as the body of the valance. Press under .50" on the top of the hem facing. Press well. Unfold the side hems of the body of the valance. Placing right sides of the fabric together, place the hem facing on the bottom of the valance, aligning the bottom edges of the scallops with the bottom of the facing and aligning the side edges. Pin the hem facing in place. Trim the hem facing to match the scallops on the body of the valance. Sew the side of the scallop by sewing in the side hem fold starting at the top of the facing. Sew the scallops using a 1/4" seam allowance. Stop at the top of each scallop, pivot, sew two to three stitches parallel to the top of the valance, pivot again and continue sewing the scallops. Repeat for each scallop and continue to sew the opposite end the same way you sewed the first hem side. Clip where you pivoted and grade the seam allowance, leaving the facing seam allowance the longest. Trim the side hem leaving enough for the end of the side hem to be enclosed in the scallop facing. Turn the scallops right side out. Carefully push all seams to the edges and press well. Re-press the side hems in place. Sew the side hems in place, stitching as close to the edge as possible. Use a blind stitch or straight stitch to sew the scallop facing, depending on the desired finished appearance. Press under 5 1/2" on the top of the valance. Press under 1/2" on the raw edge. Sew a straight line of stitching along the hem edge. Sew a second line of stitching, 3" from the top folded edge of the valance.